Mark is interested in a wide range of ecological and evolutionary problems. He uses a range of approaches from simple analytical models, through to evolutionary stable strategy models for the evolution of plant traits and more complex structured models, in particular integral projection models. He is also interested in statistical estimation problems related to the analysis and interpretation of ecological experiments, and in a more applied setting, using models to explore the dynamics and control of invasive weeds. 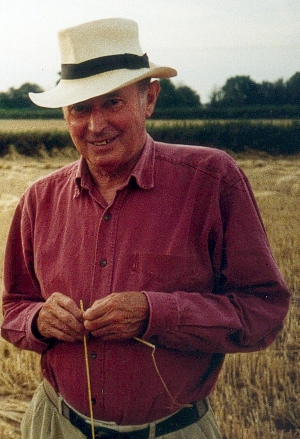 Being interested in plant demography my ecological inspiration is an easy choice – John Harper, who was instrumental in establishing the field. His book “The Population Biology of Plants” is a substantial tome, some 892 pages, and curiously enough I used this only a few days ago to explain the law of constant final yield. The book is a fascinating account of plant population biology structured around the life cycle of a plant, and although published in 1977 it is still a wonderful source of ideas and information. The paper I’ll focus on is “Interference in dune annuals: spatial pattern and neighbourhood effects” with Richard Mack (Mack & Harper 1977). In this paper the authors explore the dynamics of competition – or should I say interference – in five autumn-germinating dune annuals. The approach is experimental, using a range of different mixtures to estimate the influence of each species on the others at the population and individual level. At the individual level the analysis is quite remarkable as 13,000 plants were mapped and the “results suggest the effects of the presence of neighbours are not diffuse through the population but involve rather precise, quantifiable local interactions. The size and the distance and pattern of distribution of neighbours together account for up to 69% of the variation in individual plant weight”. This was one of the first demonstrations of multi-species neighbourhood competition, accounting not only for plant size and distance but also how the plants were arranged around the focal plant. Today the statistical analysis would be straightforward with current computing power, but in the early 1970’s this would have been done on a mainframe with the data stored on punch cards! Yes, physical paper cards with holes in them. The pattern of competitive ability was the same at the population and individual level, and precisely related to seed mass with the larger-seeded species being competitively dominant (Rees 1995). This result led to the idea that competition-colonisation trade-offs could be important in communities of annuals – large-seeded species are good competitors but poor colonisers as they produce few seeds, and vice versa. Numerous papers have since developed and explored this idea – Rees 1995; Rees, Grubb & Kelly 1996; Turnbull, Rees & Crawley 1999; Leishman 2001; Leishman & Murray 2001; Levine & Rees 2002; Murray & Leishman 2003; Turnbull et al. 2004; Turnbull et al. 2007; Muller-Landau 2010 – to name but a few. Some field experiments have tested the effect of seed mass on competitive ability and found no effect (Eriksson 2005) suggesting that models for the evolution of seed mass based on links between seed mass and competitive ability (Geritz 1995; Rees & Westoby 1997; Geritz et al. 1998) are unlikely to be relevant to real communities. This leaves us with a problem – how should we weight the evidence from very different sorts of studies? Do you believe beautiful controlled but possibly unrealistic experiments in the greenhouse or messy realistic field experiments? This is a question that’s hard to answer in general, but the popular idea that effects that are statistically significant are not biologically significant because they account for little of the variance (say seed mass accounts for 1% of the variance is seedling performance) is almost certainly wrong in this and many other cases. Eriksson, O. (2005) Game theory provides no explanation for seed size variation in grasslands. Oecologia, 144, 98-105. Geritz, S.A.H. (1995) Evolutionarily stable seed polymorphism and small-scale spatial variation in seedling density. American Naturalist, 146, 685-707. Geritz, S.A.H., Kisdi, E., Meszena, G. & Metz, J.A.J. (1998) Evolutionarily singular strategies and the adaptive growth and branching of the evolutionary tree. Evolutionary Ecology, 12, 35-57. Leishman, M.R. (2001) Does the seed size/number trade-off model determine plant community structure? An assessment of the model mechanisms and their generality. Oikos, 93, 294-302. Leishman, M.R. & Murray, B.R. (2001) The relationship between seed size and abundance in plant communities: model predictions and observed patterns. Oikos, 94, 151-161. Levine, J.M. & Rees, M. (2002) Coexistence and relative abundance in annual plant assemblages: the roles of competition and colonization. American Naturalist, 160, 452-467. Mack, R.N. & Harper, J.L. (1977) Interference in dune annuals: spatial pattern and neighbourhood effects. Journal of Ecology, 65, 345-363. Muller-Landau, H.C. (2010) The tolerance-fecundity trade-off and the maintenance of diversity in seed size. Proceedings of the National Academy of Sciences of the United States of America, 107, 4242-4247. Murray, B.R. & Leishman, M.R. (2003) On the relationship between seed mass and species abundance in plant communities. Oikos, 101, 643-645. Rees, M. (1995) Community structure in sand dune annuals. Is seed weight a key quantity? Journal of Ecology, 83, 857-863. Rees, M., Grubb, P.J. & Kelly, D. (1996) Quantifying the impact of competition and spatial heterogeneity on the structure and dynamics of a four-species guild of winter annuals. American Naturalist, 147, 1-32. Rees, M. & Westoby, M. (1997) Game-theoretical evolution of seed mass in multi-species ecological models. Oikos, 78, 116-126. Turnbull, L.A., Coomes, D., Hector, A. & Rees, M. (2004) Seed mass and the competition/colonization trade-off: competitive interactions and spatial patterns in a guild of annual plants. Journal of Ecology, 92, 97-109. Turnbull, L.A., Coomes, D.A., Purves, D.W. & Rees, M. (2007) How spatial structure alters population and community dynamics in a natural plant community. Journal of Ecology, 95, 79-89. Turnbull, L.A., Rees, M. & Crawley, M.J. (1999) Seed mass and the competition/colonization trade-off: a sowing experiment. Journal of Ecology, 87, 899-912.